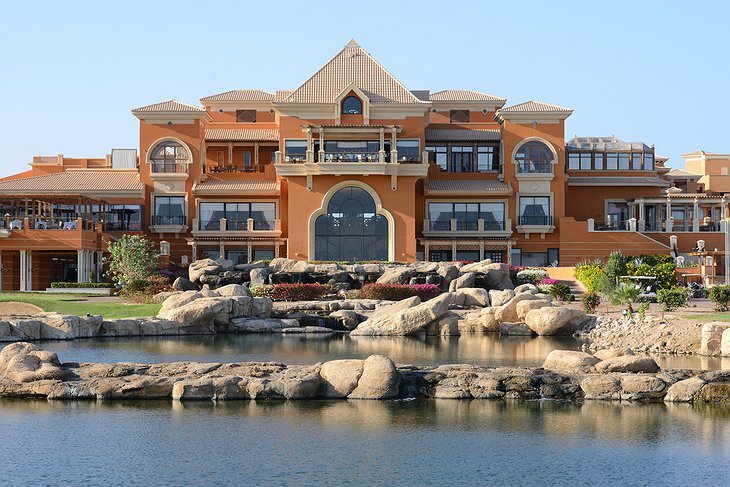 Cascades Golf Resort, Soma Bay is a Golfer’s Paradise! 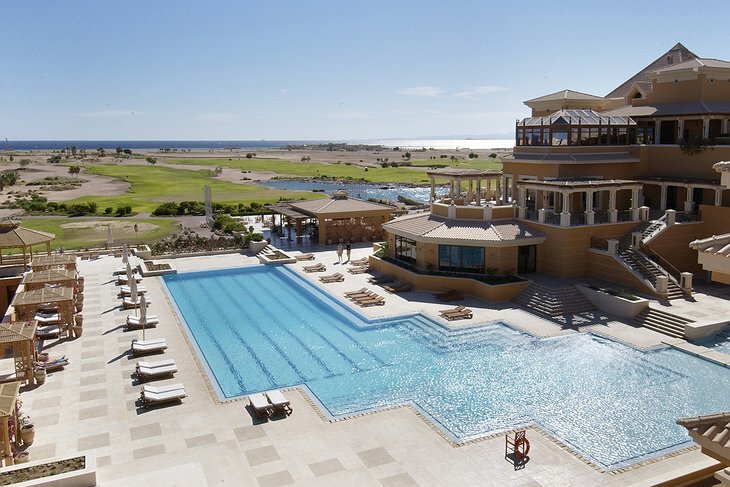 The Cascades Golf Resort, Spa and Thalasso is the first championship course in the Middle East. Designed by international legend Gary Player and consisting of an 18 hole, par 72 course and a golf academy with PGA professionals; Cascades Golf Resort is a dream golfing retreat location. 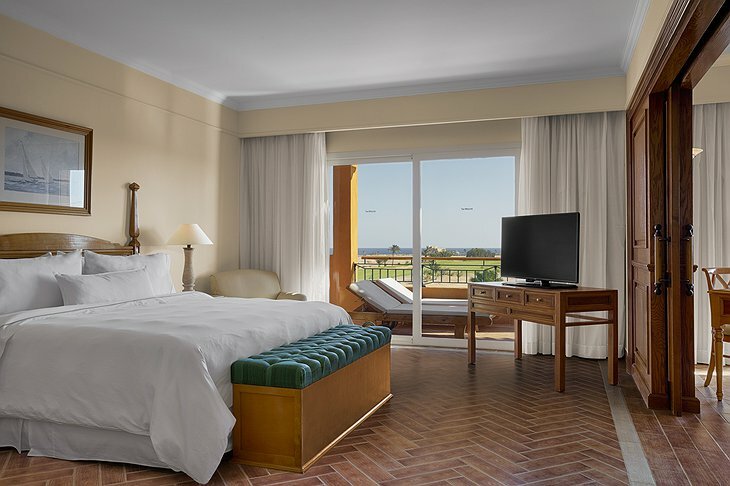 Golf players will love the fantastic 18-hole golf course while their non-golfing companions can indulge in all the amenities the 5-star hotel has to offer. it offers memorable views of the lush green fairways that contrast dramatically with the rugged desert and the clear blue sea and the Cascades Golf has been ranked the number 1 golf course in the world outside of Europe for the 4th year running. The resort’s championship golf course is located on the highest point of the Soma Bay peninsula and offers sweeping views of the Red Sea and desert mountains. The golf course is not the only highlight, though. The hotel’s private beach is a long stretch of fine white sand that will immediately make you feel all the holiday vibes. Relaxing with a cocktail is definitely a good choice here but not the only one. One can try windsurfing, kitesurfing or sailing at a nearby water sports centre that offers training and rents out the equipment. And it would be a sin not to enjoy Soma Bay’s beautiful coral reef. This luxury hotel provides a large lap pool overlooking the greens and this resort has a private beach 3 minutes away by shuttle bus which departs every 20 minutes from the hotel, and it is the only private beach to offer a free WiFi service even in public areas. Private balconies are standard in all rooms. Each is air conditioned and provides plenty of space. All rooms are fitted with large bathrooms, including a separate bathtub and shower. After a busy day, one can unwind at the tonic pool with jets specifically designed to target different muscle groups and improve your circulation. 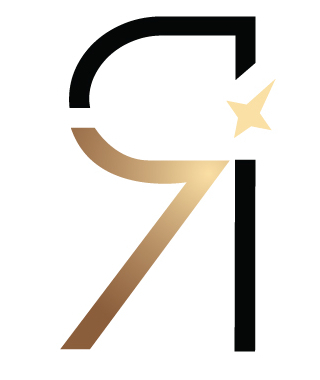 The inhouse spa that spans over an area of 7,500 m2 is one of the biggest in the world with 65 treatment rooms that offers a wide range of services from massages to facials and pedicure so budget some time for a proper pamper session. Indoor and outdoor dining is offered at the Seasonal Taste restaurant, with views of the golf course and the Red Sea. Aromatic teas are served in the intimate Gallery, while casual drinks can be enjoyed at the British-style Eagle’s Nest pub. Located on The Cascades beach, Seashell Beach Restaurant enjoys a sea view and a cozy atmosphere. 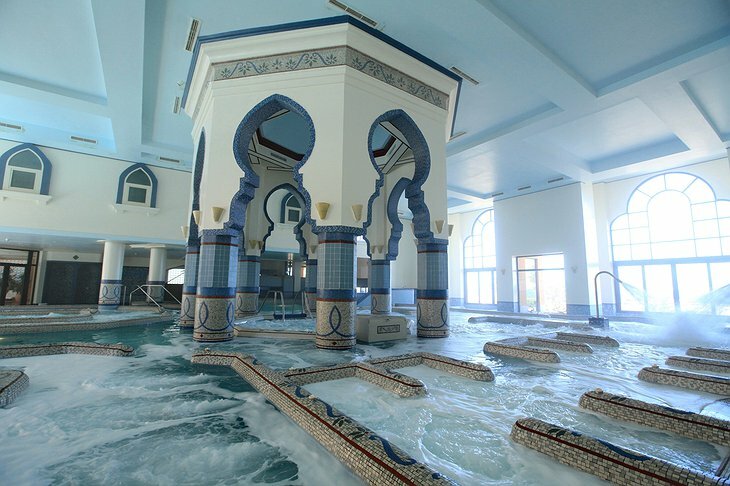 The Cascades Spa and Thalasso also offers a salt water pool and a variety of massages and hydro-therapies for slimming. Guests can enjoy free and unlimited usage of the gym, tennis and squash courts, sauna and steam room. The Cascades Golf Resort, Spa and Thalasso, Soma Bay is 40 km from Hurghada International Airport. Transportation to and from Hurghada port can be arranged. Soma Bay is a great choice for travellers interested in sandy beaches, water sports and snorkeling and this property is also rated for the best value in Hurghada.